Hello and welcome the the Maui Gran Fondo. 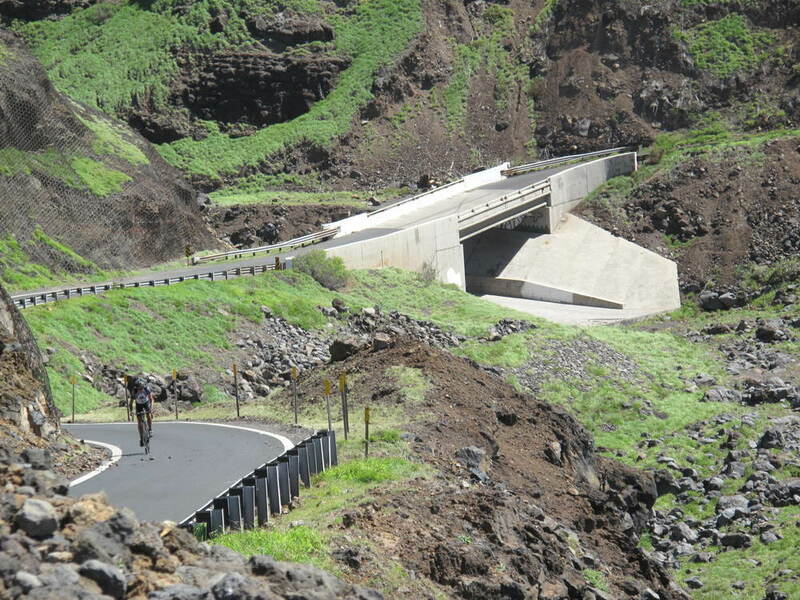 This is an amazingly scenic route around Haleakala on the beautiful island of Maui. The route will blow your mind and maybe your legs too. This is a very hard hilly and hot event and not for the less than superbly fit and ready athlete. It is 95 miles long most of which is at or near sea level. It will climb 10 thousand feet during those 95 miles and finishes with a 3 thousand foot climb going past the big wind mills, the Tedeschi winery and then to the finish in Keokea. There will be a neutral, controlled start till Hana Highway. It starts and finishes in the sleepy little town of Keokea and goes clockwise from there toward Makawao then down to Hana Highway and out to Hana. From there it continues toward the start of the desert in Kaupo. During this ride there are approximately 3 miles of gravel road followed by the bumpiest 5 miles of road you will ever ride. I promise. Then you climb from there back up to Keokea with the wind normally at your back and the sun burning a hole in your head. It will be a long day for sure. The fastest guys will complete this in under 5.5 hours and it will take most people from 6.5 to 9 hours to complete. There will be 4 aid stations along the route. Most will be toward the final half of the ride. You will want to bring at least 2 Large water bottles as you will be sweating more than you can imagine. Sunscreen is a must and bring along your favorite fuel. We will provide Ice and Water and Gels at each aid station so you can fill your bottles along the way. Be sure to bring a good repair kit as the 8 miles of rough road can either vibrate things loose or pinch flat a tire if you hit something just right. At the finish we will have food ready for you to eat and plenty to drink. I look forward to seeing you complete this EPIC event. It will be one that you won’t forget. The route starts in the small sleepy town of Keokea and then heads toward the old paniolo town of Makawao. It then heads on toward Hana Highway most of this first part is downhill and easy miles. It will be cool in the morning when you start. From Hana Highway you take a right hand turn and head due east and start the windy road to Hana with its one lane bridges and beautiful swimming holes and waterfalls along the route. 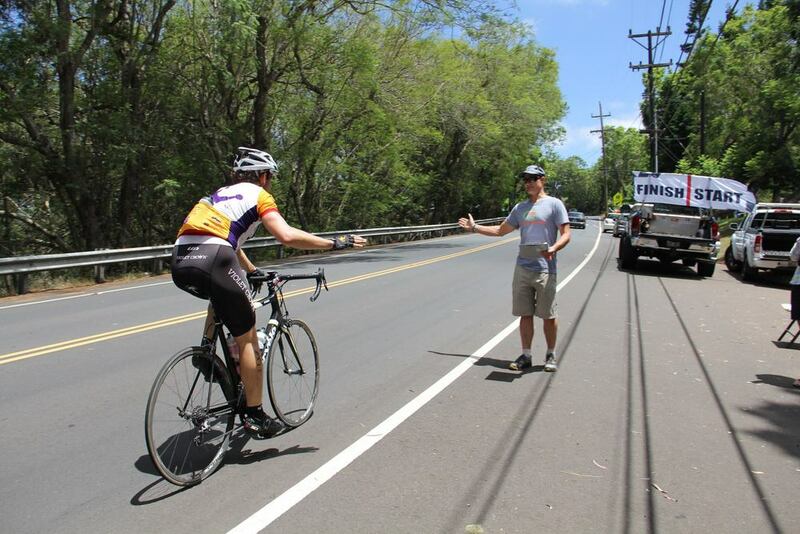 At about the half way to Hana you will come to the town of Kaenae and Aid station #1, from here you will start the first major long climb of about 5 miles up to Puaaka State Wayside Park. From there it is a nice 7 mile mostly downhill ride to Hana. In Hana area will be Aid Station #2. From Hana you will ride past the 7 pools area or Kipahulu National Park. A few miles past 7 pools the dirt and gravel road begins. There are about 3 to 5 miles of this type of road. Then you will Hit Aid Station # 3 in Kaupo area. Then just after Kaupo the road really begins to be rough. It is a patchwork of road patches unlike anything you have experienced. It is rough. Very rough. You water bottles may shoot out of your cages. Your tool kit, bike mirrors or any other part on your bike may vibrate lose or break. You could pinch flat or any number of things could go wrong here so be sure that your bike is ready for this. Then you will begin a long HOT climb out of Kaupo and up toward Ulupalukua. There along this windy windy road we will have aid station # 4. Then continuing on up to the small town of Ulupalukua where it begins to cool down and there is a flat section of road to have another and final Aid Station #5. From there you have just 3 or 4 miles to go to get back up to Keokea and the finish line. 95 miles and 10,000 feet of climbing in total.